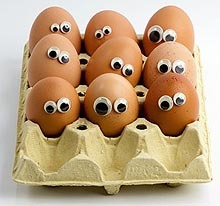 Egg allergies are more common in infants and children than adults. The reaction mostly occurs to the egg white proteins (albumin and ovomucoid). Symptoms include eczema and other skin problems. It is important that egg only be introduced to infants from 10 months of age. Food which contain egg include: mayonnaise, salad cream/dressings, meringues, marshmallows, baked products, processed meats, crumbed food and food with a batter. Pies and pastries are often coated on top with egg.